Until now, Carlos Bordeu has only been known as the ‘C’ in ACE Team. He’s about to become much more. No longer will he be the letter squished between his brothers Andres and Edmundo in the title of the Chilean videogame studio they founded together. Carlos has revealed that he’s working on a personal project called The Endless Cylinder and it has all the qualities of a surrealist sci-fi painting, except it invites you to dive in and look around—there’s just one caveat: please don’t trip over your trunk. All that is known about The Endless Cylinder at the moment is contained in the video you can watch below. You are newly born into a world that is “somewhere unrevealed, sometime unknown,” breaking free from an egg as a saggy-eyed ball of soft flesh, sporting a floppy speckled trunk and two sturdy if stubby legs. To me, it looks like a chicken has somehow had it off with an elephant: this is the result. There’s a lot to look at immediately. A huge fiery planet with stripy rings blisters in the sky, its gigantic portrait only slightly obscured by the spiky arch leaning out of the ground, and a strange alien plant that somehow supports a huge walnut-like pod on a thin stem. The flora alone upon this world is worth holding a scientist’s eye to, wondering how it got so big, or why it looks like a seashell. But then you see what is truly dominating and threatening the landscape; the so-called endless cylinder. It slowly rolls, crushing everything before it with an unstoppable and unknown mechanism. It’s a Lovecraftian idea rendered as moving architecture: bigger than life, bigger than understanding, listless in its momentum, impenetrable and callous. It may not seem to have a purpose in this world but it does if you back out for a sec and look purely at the videogame containing all of this. This cylinder is here to keep you moving away from it. The exploration that begs for you will have to be done with some haste. There will always be somewhere to go—away from instant, crushing death—and the cylinder will ensure that any hidden creature on the land will be disturbed for your curiosity. Lo and behold, after the true destructive might of the cylinder is shown off in the video, the planet’s peculiar fauna starts to turn up. The first creature delivers two frights, 1) in how it suddenly moves into action from motionless, and 2) how its anatomy resembles both an arse on legs and an upturned mouth with a full-set of teeth. It’s terrifying, better understood as some Hammer Horror experiment gone wrong than proposed as part of a working ecosystem. But before you can truly get a breather (or your head around it), an elephant-truck hybrid storms onto the scene, strangely rushed considering it’s the only traffic on this terrain, speeding towards the deathly cylinder in either blindness or stupidity. My response to seeing The Endless Cylinder for the first time went something like this: It’s about damn time that we got to play as one of ACE Team’s bizarre alien creatures rather than punching them square in the face with a human fist. ACE Team has a longer history than most realize. The three brothers that founded it started with a total conversion mod of Doom II called ZanZan way back in 1999. 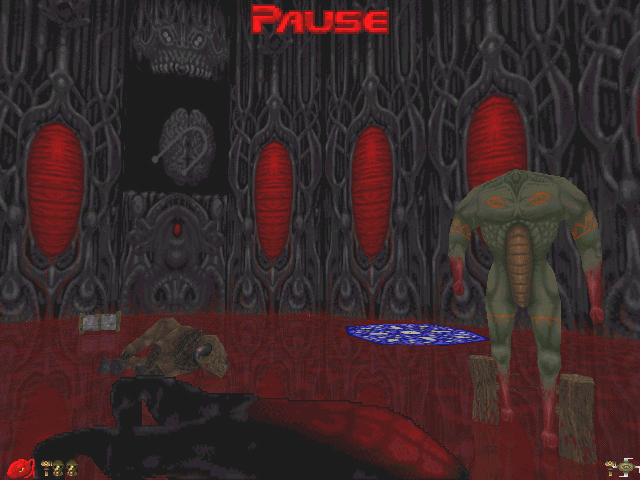 ZanZan doesn’t look much like Doom II (it looks like this), focusing more on melee fighting and taking place in an ancient alien fortress divorced from the part of the universe we’re familiar with. ZanZan is the basis for what would become ACE Team’s signature after constructing the vivid tribal lands and wild hybrid beasts of Zeno Clash, its sequel, and the Bosch-fantasy panorama turned videogame Rock of Ages. It’s the imagination poured into the environments and the populations that inhabit them in these games that had ACE Team win me over. But the studio’s latest title seems to have lost its willful belonging to the lineage of surrealist art. Instead, The Deadly Tower of Monsters takes from 1950s B-movies and it’s not quite as compelling, at least for me. And so I’m pleased that Carlos has gone out of his way to work on something closer to ACE Team’s roots, even if it apparently won’t be considered an ACE Team game. The Endless Cylinder may be in its early days yet but there’s plenty enough on show to have me patiently await its slow-rolling arrival.